Online Registration is available again this year via PayPal. No extra service fees will be added when registering online. You do not need a PayPal account. You can also register by mail. Register early, on or before September 27th, to guarantee your shirt size and save money. After midnight on the 27th registration fees increase. Register at the Beach: We will accept cash, checks, or credit cards for late registration and/or shirt sales at the beach. Rules - The regatta will be governed by the "rules" as defined by the ISAF Racing Rules of 2013-2018, including Appendix B – Sailboard Racing Rules, and, where applicable, the Kona Class Rules, and any other class rules for one design classes, these sailing instructions, instructions posted on the official race notice board, and verbal instructions given at any official Skipper’s Meeting. Racers under 18 – All competitors under 18 are automatically registered to race if their parent(s) have registered for the event. 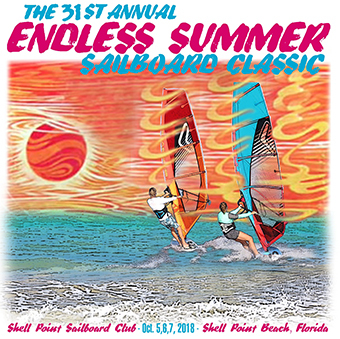 The Event - The Endless Summer Sailboard Classic is sponsored by the Shell Point Sailboard Club and others. This don't-miss regatta weekend has plenty of racing and fun to offer for both the serious racer and the social regatta participant. A Swamidelic custom shirt by Homestead is also provided to commemorate the event. Racing format is determined by the wind conditions and may include course race, slalom, long distance and/or freestyle; with trophies going to the top three finishers in each class. Add great door prizes to the mix and you have a don't-miss regatta! The many event activities are listed below. Registration - Register online at www.20knotsnob.com using Paypal. Or print the Entry form, fill it out and mail it to us with your check. Our address is on the Entry form. Questions: Contact, Joe Sisson at (850) 321-8157. Classes - Longboard, Sport and Novice. We may have a Kona class, if we have enough Kona sailors. Classes may be added or eliminated at the discretion of the Race Committee. It’s that time of year again. You’ve had a year to perfect your fabulous award winning gumbo recipe. And for those who haven’t entered this prestigious competition before, dust off your cook books, fire up the stove and get your Cajun groove on. The competition is stiff, but the bragging rights are worth the effort. All proceeds from the sale of the gumbo and Donaldo’s special hot dog entrees will go to SPSC. To enter, just let Don or Sharman know at art@homesteadtshirts.com or call us at 229-872-3202. Bring your entry to the beach by 10:00 Saturday morning the day of the regatta. Make at least a gallon of gumbo and bring it in a container with a lid that can be placed in a cooler. Thank you in advance. We’ll see you at the beach. Must be a current member to vote for officers and board members at the September meeting.